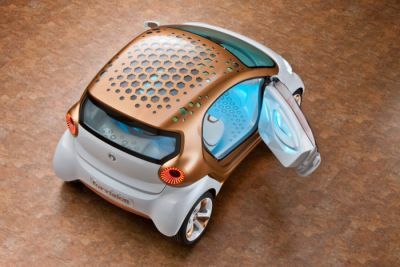 Remember Daimler's Smart Forvision concept EV? That car has a transparent solar-panels on the roof, see-through dashboard and transparent OLEDs for internal lighting - on the roof of the car. We knew that Daimler was collaborating with BASF on this concept, and today BASF released a press release saying that indeed they developed those panels together with Philips. The OLEDs are transparent when switched off, allowing for a clear view outside the vehicle, yet providing light only within the vehicle when switched on. The transparent OLED sandwich structure can be combined with equally transparent solar cells, as was demonstrated in the Smart Forvision. This development was achieved as part of a longstanding cooperation (since 2006) between BASF and Philips in the research and development of OLED modules.